The Well-Digger’s Daughter, a pastoral romance set during the early days of WWII, marks the directorial debut of French film star Daniel Auteuil. 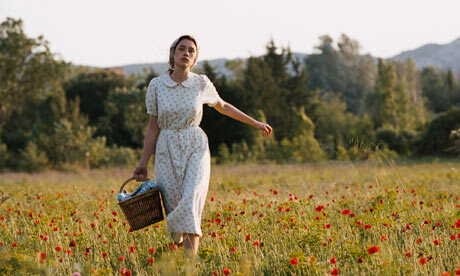 It’s an artistic homecoming of sorts, as the 2011 film is a remake of a 1944 work by Marcel Pagnol, the filmmaker and novelist who penned the source material for the films in which Auteuil achieved early fame as an actor: Manon of the Spring and Jean de Florette, both from 1986. Astrid Bergès-Frisbey is The Well-Digger's Daughter. The provencal Pagnol is best known for his “Marseilles Trilogy” (which was condensed and remade in America as 1961’s Fanny). While The Well-Digger’s Daughter takes place in the countryside, its story follows a similar line to its more famous city cousin: A young woman, Patricia (Astrid Bergès-Frisbey) is literally swept off her feet by a handsome young man and faces becoming a “lost girl” or marrying a kindly family friend she does no love. As the well-digger with, actually, six daughters, leading player Auteuil is superb as a man torn between love and maintaining his family’s reputation. Indeed, all the performances avoid stereotype and find the underlying humanity which has made Pagnol’s stories perennials. As the film’s director (and screenwriter), Auteuil never stands back and judges the social code that motivates the characters, instead drawing us into their plight with truly moving effect. For these people, close to the Earth, foibles be forgiven and community is a balm for all wounds. Speaking of the Earth, the exquisite cinematography by Jean-Francois Robin is a visual love poem to the countryside of Southern France.